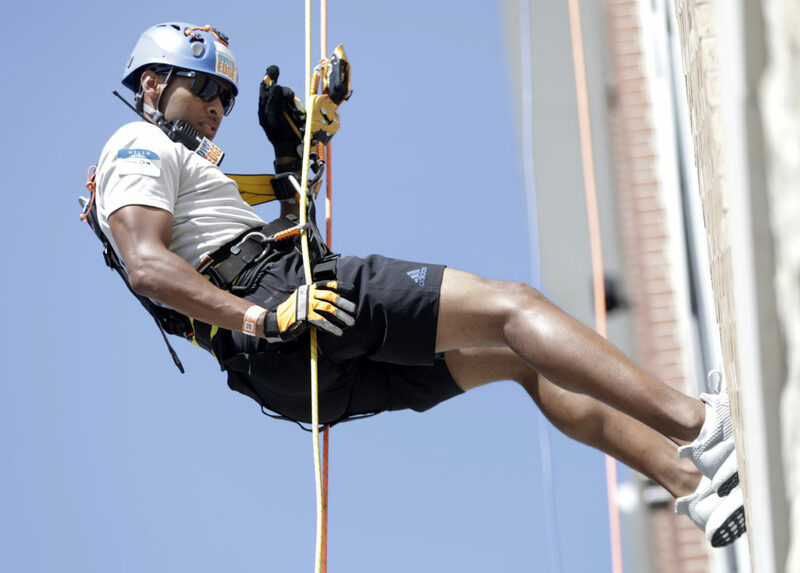 Kansas men's basketball assistant coach Kurtis Townsend rappels down the 888 Lofts, 888 New Hampshire St., in the Over the Edge fundraising event for Boys & Girls Club of Lawrence, Saturday, Aug. 25, 2018. 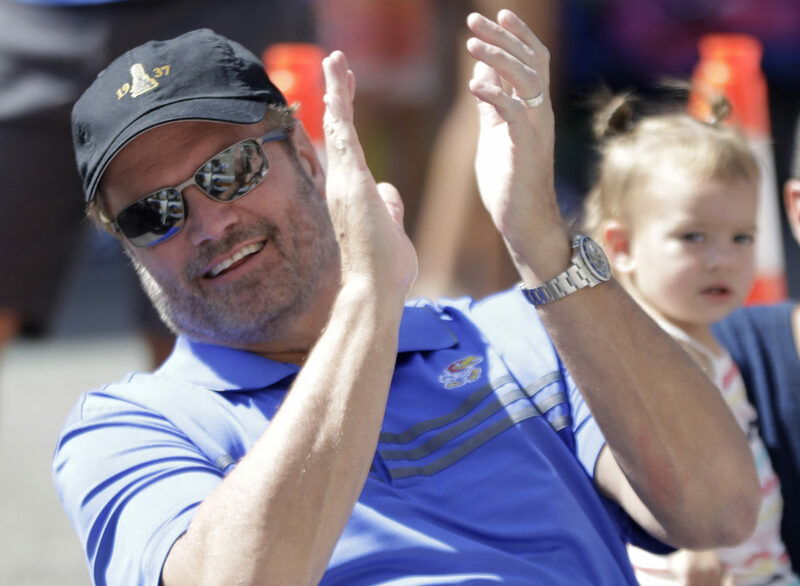 Seated seven stories down, near the corner of Ninth and New Hampshire streets, Kansas basketball coach Bill Self craned his neck to watch assistant coach Kurtis Townsend and former KU basketball players Jeremy Case and Jeff Hawkins rappel down the 888 Lofts building for Saturday’s “Over The Edge” charity event. Originally slated to be the one in the harness, Self was forced to miss the event, a fundraiser benefiting the Boys & Girls Club of Lawrence, because of hernia surgery last week. Not to worry. 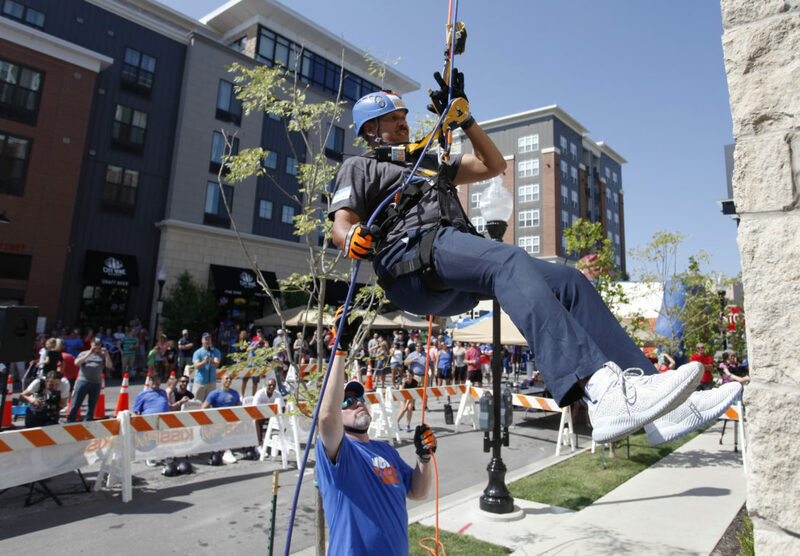 Things went right in many ways on Saturday, when dozens of participants and 300-plus spectators helped raise nearly $90,000 and enjoyed the nonstop, seven-story rappelling that filled downtown with energy and applause throughout the day. 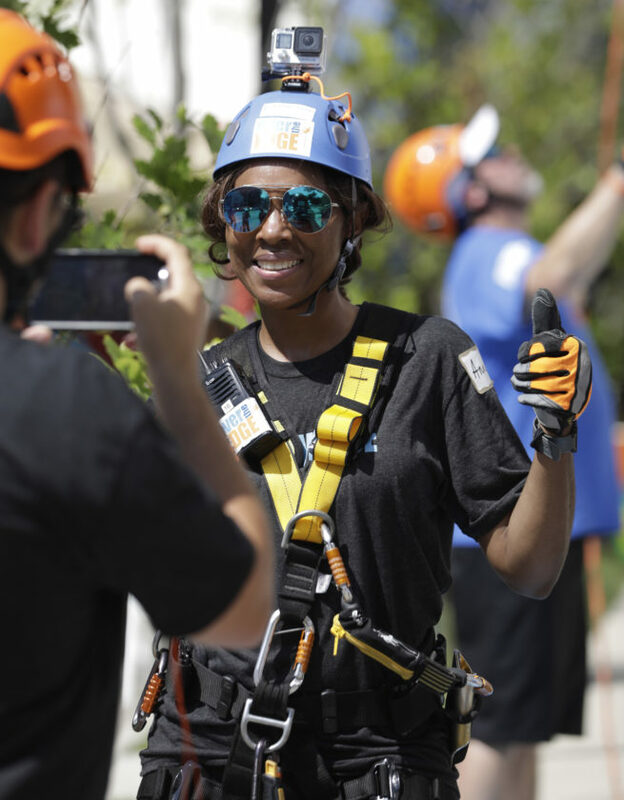 Boys & Girls Club supporters from all walks of life — businessmen, civic leaders, parents, local businesspeople and the club’s staff members — made the climb to the roof and strapped into the ropes for Saturday’s unusual event. Anna Stubblefield, the Lawrence school district's deputy superintendent, rappels down the 888 Lofts, 888 New Hampshire St., in the Over the Edge fundraising event for Boys & Girls Club of Lawrence, Saturday, Aug. 25, 2018. Each participant, known as an “edger,” was required to raise at least $1,000 for the opportunity to rappel — two people were so energized by the event that they signed up on the spot — and many climbers easily eclipsed that goal. 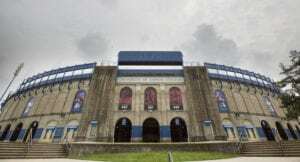 The two biggest contributors to the fundraising effort were Self and his team and Anna Stubblefield, deputy superintendent for the Lawrence school district who, months ago, vowed to outdo Self’s $10,000 goal by raising at least a dollar more. Although Self did not make it to the roof, Boys & Girls club staff said he did make good on his fundraising goal, and that Stubblefield did, as well. However, staff didn’t have more concrete figures for what each participant raised, in part because the “edgers” are still allowed to raise money for 30 days after the event. 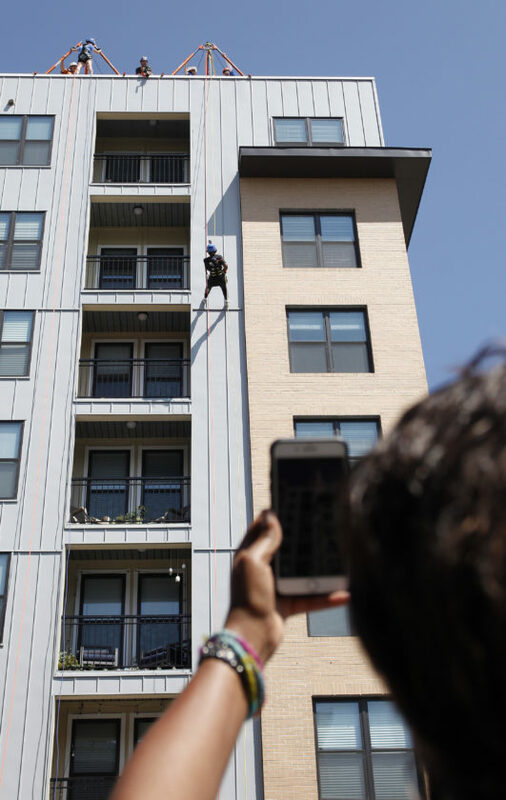 Stubblefield rappelled down the south side of the building to the cheers of several friends and family members — and the heckling sound of her husband’s voice. Despite Self having to bow out, Stubblefield said she was thrilled he participated in the fundraiser in the first place and told him so before she took her turn on the wall. 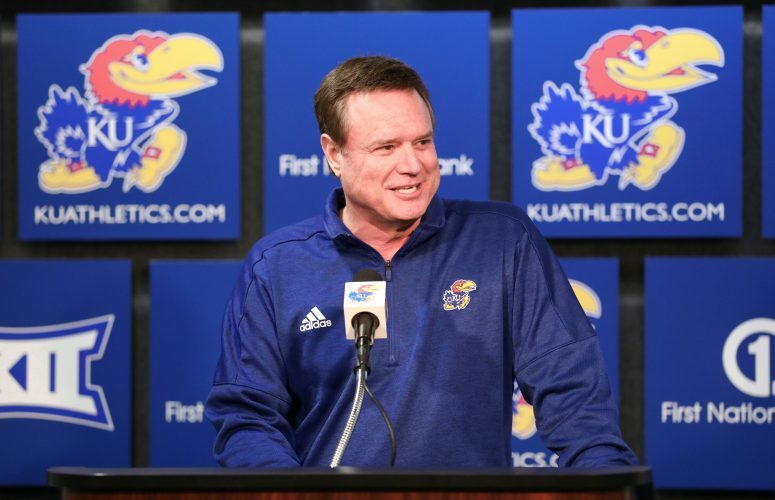 When the former Jayhawks made their climb down, they were greeted with loud cheers from KU fans and event supporters. Jeremy Case, video coordinator for the KU men’s basketball team, rappels down the 888 Lofts, 888 New Hampshire St., in the Over the Edge fundraising event for Boys & Girls Club of Lawrence, Saturday, Aug. 25, 2018. 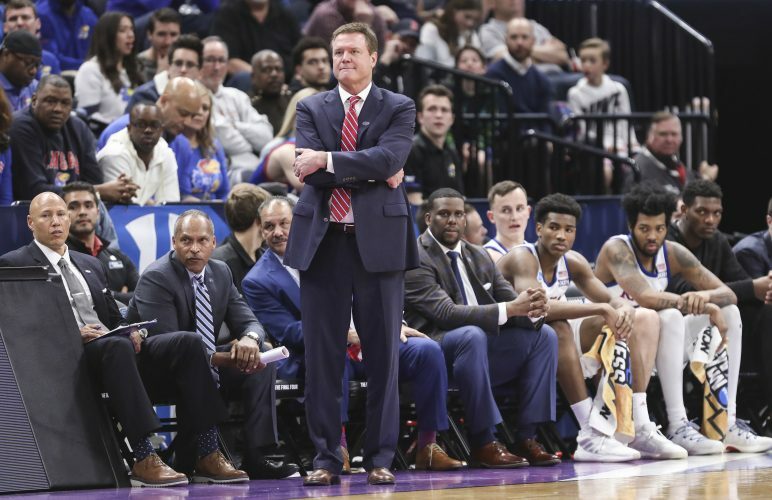 Townsend was the first to go, and his slow-but-steady approach impressed Self and fellow KU staffers Norm Roberts, Fred Quartlebaum, Brennan Bechard and their families. 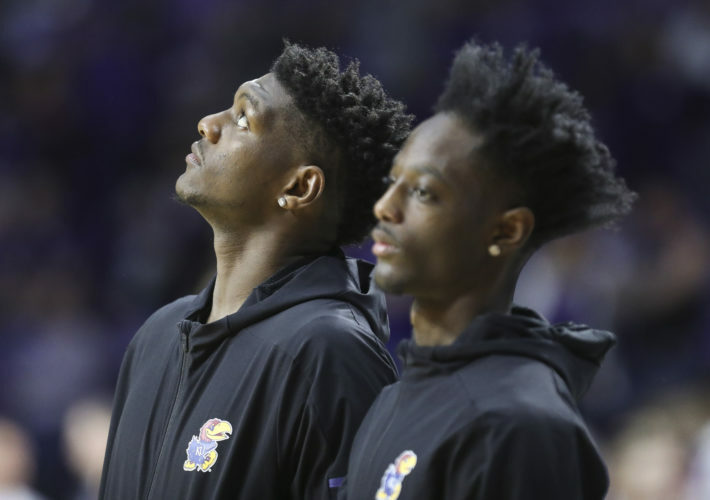 Case and Hawkins were hoping to race each other, but neither member of past KU backcourts got the opportunity to truly let it rip. Case blamed it on the safety mechanism that locked up when a participant got going too fast. “I was trying to get down there quick,” Case joked. 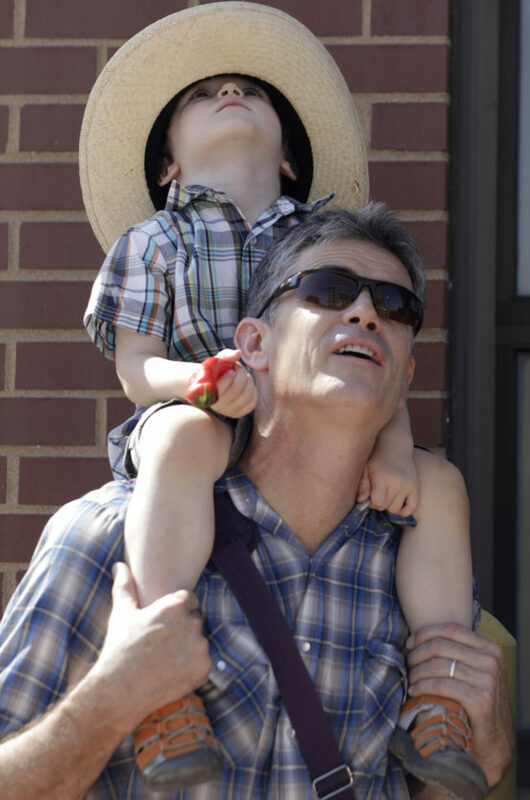 Ira Dellett, 3, and his father Tim Dellet, both of Lawrence, watch participants rappel down the 888 Lofts, 888 New Hampshire St., in the Over the Edge fundraising event for Boys & Girls Club of Lawrence, Saturday, Aug. 25, 2018. And Hawkins got his climb off to a rough start after slipping out of the gate. 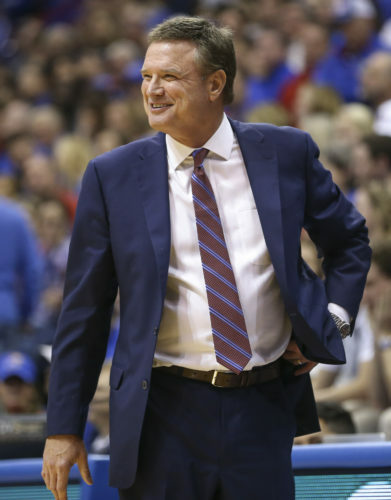 The gaffe brought on a little heckling from Hawkins’ son, Mav, during the climb and some from his former head coach when he was safely on the ground.